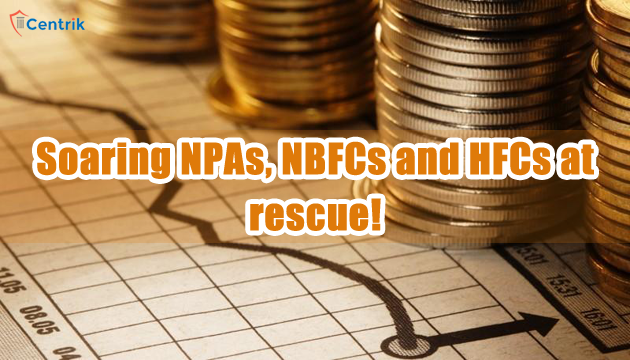 CentrikBlogsLegal AdvisoryDebt Recovery ManagementSoaring NPAs, NBFCs and HFCs at rescue! Non-banking finance companies and mortgage lenders, which control the lion’s share of developer loans, are using all the tricks in the marketing and finance trade books to help realtors still smarting from the pains inflicted by the note-ban, Rera and GST, to sell their inventory so that these lenders secure their monies. According to a recent report, non-banking finance companies and pure-play mortgage lenders have an exposure of a whopping Rs 2.2 trillion of the Rs 4 trillion developer loans market, while commercial banks’ exposure is much lower at Rs 1.8 trillion only. “NBFCs which have lent to small and mid-sized developers will be in serious recovery mode. We believe that NPAs reported by NBFCs focused on the realty sector will increase in 2018. These lenders may also drive smaller firms to consolidate with reputed developers,” Sahil Vora, founder and managing director of realty consultant SILA told PTI. The number of unsold ready-to-move-in homes is estimated at 34,700 in the top seven metros of Mumbai, Delhi-NCR, Chennai, Hyderabad, Pune, Bengaluru and Kolkata. “While banks have been reducing their exposure, NBFCs have significantly increased their exposure to the realty sector backed by benign liquidity and interest rate environment of late. Seasoning and tenure of loans, city- and developer-wise exposures, and yields on loans show NBFCs/HFCs have significantly riskier real estate loan books than banks,” Ambit Capital’s Pankaj Agarwal said in the report. NBFCs and HFCs also have huge liabilities upon them! “Some have even assisted in providing home loans to buyers thus ensuring sales,” he added. Saurabh Gupta, vice-president and fund manager at IIFL Real Estate Practice said, “We are always monitoring developers and wherever direct or indirect involvement is required, we have to step in.” His company assists developers in various areas like sales, getting them introduced to a sales partner or private wealth partners so that inventory can move. “Sometimes we show the developers the market trends so that they can reprice, resize or tweak the product design. Also, sometimes there can be capital engagement wherein the capital market players may suggest an alternative capital structure,” said Gupta. “Advantage of NBFCs is that they can adopt various tools for corporate debt restructuring without resorting to refinancing as they are not under the purview of the regulations that guide the commercial banks.